General Encouragement For Your Life! Sometimes we all seem to wonder and lose track of where we need to go, but with some general encouragement, we always seem to get back on track. 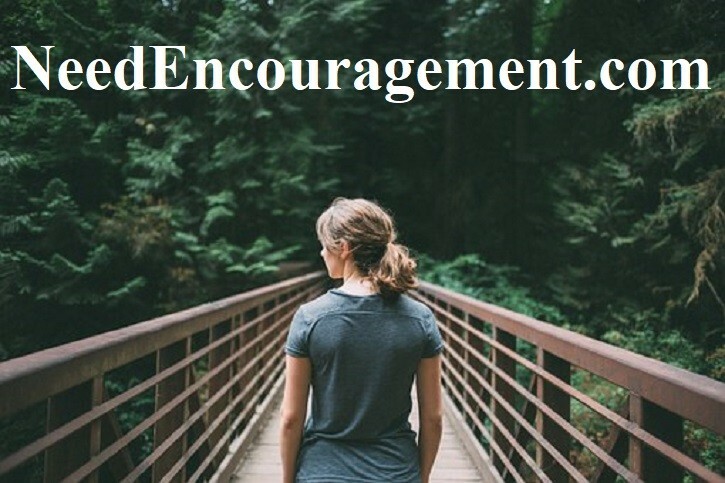 Here are some encouraging scriptures concerning encouragement. God Loves You And Has A Plan For Your Life! How Can You Find General Encouragement? General encouragement comes when you know where to look for the assistance! When you need general encouragement in your life, where do you turn first? Do you go to a friend to talk to? Do you pray first? What do you do? My suggestion is to stop and sit quietly and begin to ask God in prayer for whatever needs you may have at this time. You can do this sitting right in front of your computer. We each seek general encouragement in different places, but it is best to go to God for help by praying, by reading His Word, and by spending time with other believers. Once you pray and ask for God’s help, he will speak to you in some way or another. After doing this, I then suggest sharing your concerns with a Christian friend, pastor, or a least someone who cares enough to help point you to Jesus Christ. Without help from someone, it can be tough to practice living out your faith because of the many temptations that there are in this world. What We Encourage You To Do With Your Life? What Does Hope Have To Do With Encouragement? Consider this: Your thoughts are like a train engine, and the caboose is like your feelings. The problem comes in when we allow our emotions to run the train, rather than sound knowledge and wisdom. You need to have hope that your situation will improve and have faith that God is the answer to all your difficulties, then you will be on the right track. It is not necessarily about finding happiness in your life, but instead about finding God and then to follow Him in your daily life. Psalm 46:1 God Is Our Refuge And Strength, An Ever Present Help In Times Of Trouble. Written By A 90-Year-Old Columnist For The Plain Dealer! A local Newspaper, of Cleveland, Ohio. 2. When in doubt, take the next small step. 3. Life is too short – enjoy it with God’s help. 8. Getting angry with God is OK. He can take it! 9. Save for retirement, starting with your first paycheck. 11. Make peace with your past so that it won’t screw up the present. 14. If a relationship has to be a secret, you shouldn’t be in it! General Encouragement Ultimately Comes From God! 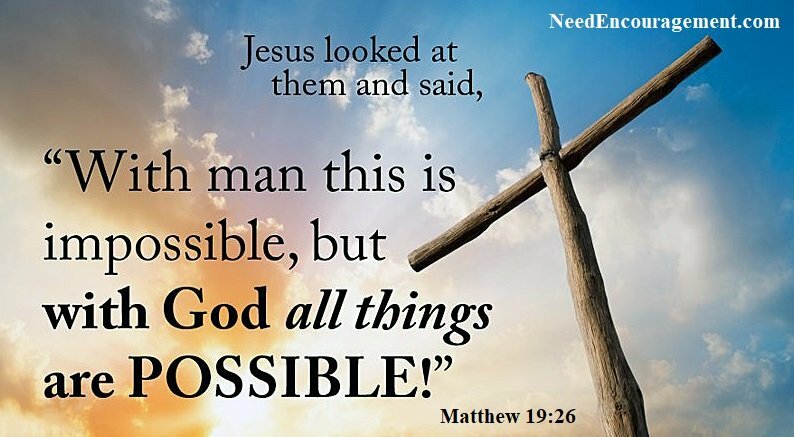 With God’s Help, All Things Are Possible! 17. Get rid of anything that isn’t useful. Clutter weighs you down, in many ways. 18. Whatever doesn’t kill you does make you stronger. 19. It’s never too late, to be happy. But it’s all up to you and no one else. 21. Burn the candles, use the nice sheets, wear the fancy lingerie. Don’t save it, for a special occasion. 22. Over prepare, then go with the flow with God’s help. 25. No one is in charge of your happiness, but you. 29. What other people think of you, is none of your business! 30. Time heals almost everything. Give time some time. General Encouragement To Understand Clearly? Do You Pray First And Take Your Problems To God? 31. However good or bad a situation is, it will change with God’s help. 34. God loves you, because of who God is, not because of anything you did or didn’t do. 39. Get outside every day. Miracles are waiting everywhere! 42. The best is yet to come, with God’s help. 43. No matter how you feel, get up, dress up and show up with God’s help.